Passage at Arms tells the intimate, detailed and harrowing story of a climber crew and its captain during a critical juncture of the war. Cook combines speculative technology with a canny and realistic portrait of men at war and the stresses they face in combat. 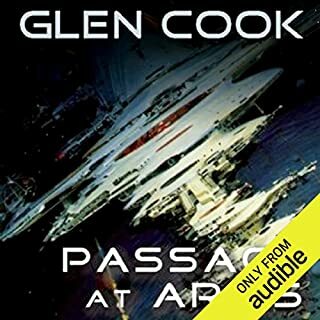 Passage at Arms is one of the classic novels of military science fiction. One Long Running Space Battle …. The world grows colder with each passing year, the longer winters and ever-deepening snows awaking ancient fears within the Dengan Packstead, fears of invasion by armed and desperate nomads, attack by the witchlike and mysterious Silth, able to kill with their minds alone, and of the Grauken, that desperate time when intellect gives way to buried cannibalistic instinct, when meth feeds upon meth. 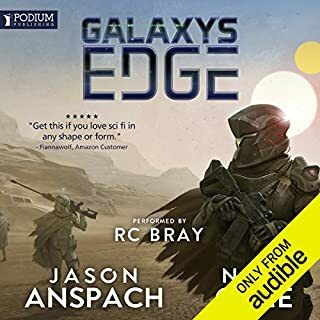 For four thousand years, the Guardships have ruled Canon Space - immortal ships with an immortal crew, dealing swiftly and harshly with any mercantile houses or alien races that threaten the status quo.But now the House Tregesser has an edge: a force from outside Canon Space offers them the resources to throw off Guardship rule. Welcome to the world of the Instrumentalities of the Night, where imps, demons, and dark gods rule in the spaces surrounding upstart humanity. At the edges of the world stand walls of ice which push slowly forward to reclaim the land for the night. And at the world's center, in the Holy Land where two great religions were born, are the Wells of Ihrain, the source of the greatest magics. A young boy's dreams of glory and war turn into a bitter nightmare as his father's kingdom is overrun by an invading army. Lost and alone in the woods, he finds an ancient sword that promises him the ability to claim his vengeance. As he begins to take that vengeance, he comes to realize the price that the sword will demand of him. Enemies soon become allies and strange bedfellows abound as the prophesies of an age swirl into chaos. The City of Qushmarrah is uneasy under the rule of the Herodians - short, balding men whose armies would never have conquered the city had not the great and evil wizard Narkar been killed and sealed in his citadel; had not the savage nomad Datars turned coat and sided with the invaders; had not some traitor opened the fortress to them. 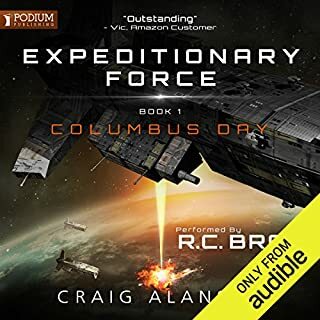 The vendetta in space had started centuries before "Mouse" Storm was born, with his grandfather's raid on the planet Prefactlas, the bloodbath that freed the human slaves from their Sangaree masters. But one Sangaree survived--the young Norborn heir, the man who swore vengeance on the Storm family and their soldiers in a carefully mapped plot that would take generations to fulfill. Now Mouse's father, Gneaus, must fight for an El Dorado of wealth on the burning half of the planet Blackworld. 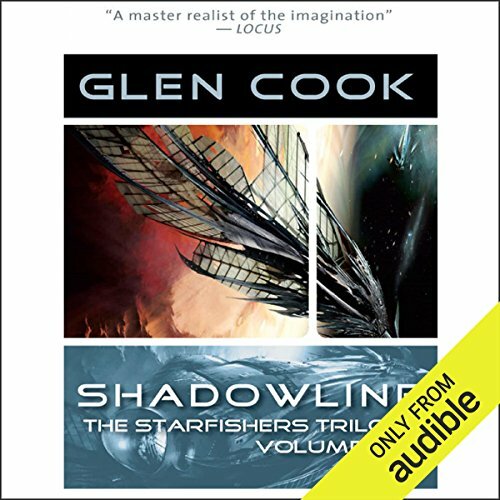 As the great private armies of all space clash on the narrow Shadowline that divides inferno from life-sheltering shade, Gneaus' half brother, Michael, plays his traitorous games, and a man called Death pulls the deadly strings that threaten to entrap them all--as the Starfishers Trilogy begins. 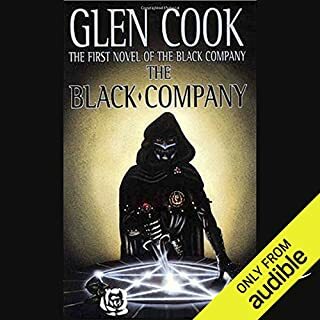 ©1982 Glen Cook (P)2014 Audible Inc.
the performance of this book was beautifully done. I like his books and to have them read with such great performances of the different characters really brought the book to life! 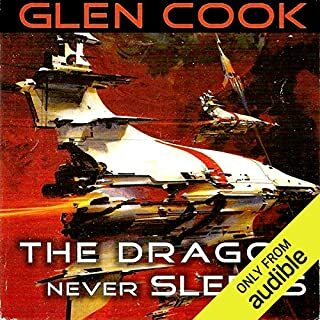 I loved the story, loved listening. I've started this book three times but my busy and active life always prevented me from completing it. 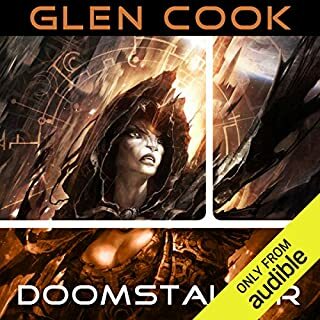 I will definitely purchase and listen to the next two books in the series. 1337 r34d5 r3v13w5 would like to thank you for r34d1ng our r3v13w. we hope you enjoy this truly epic book. Expect to fall in love with this universe.